Slugging to Work: Anonymous Ride-Sharing If you've ever sat in rush-hour traffic, gazing longingly at the cars rushing by in the high-occupancy vehicle lanes, try doing something your parents warned you never to do: Hop in a car with a complete stranger behind the wheel. Slugs are people who line up for a free ride at designated spots such as commuter parking lots and street corners. According to Slug-Lines.com, the term probably came from bus drivers, who would be on the lookout for counterfeit coins (also known as slugs). Slugs used to stand at bus stops, waiting for cars to pick them up. When bus drivers would stop, the commuters at the stops would waive them off. The bus drivers soon began calling the "fake" bus riders "slugs." 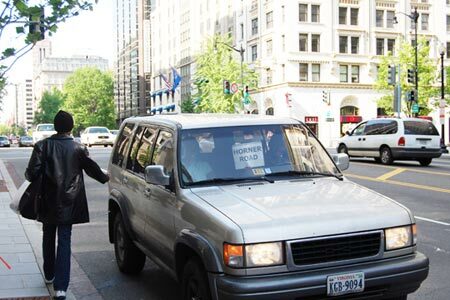 A Virginia-bound commuter catches a ride in downtown Washington, D.C.
Keep talking to a minimum. There are times when conversation is acceptable, but normally slugs must wait for drivers to initiate it. Drivers and slugs generally aren't interested in getting to know each other. They just want a quiet ride home. No money or gifts for the driver. A driver doesn't expect riders to help with gas money. If a driver wants gas money, he should organize a car pool. Keep cell phones tucked away. A short call to say, "I'm on my way" is OK, but long conversations are not. The "line" where slugs wait does not leave a woman standing alone. Call it chivalry or simply thoughtfulness towards the safety of others, but this rule has helped women feel safer. No smoking or eating. This applies to the driver or slug. No tinkering. A slug doesn't ask to change the car's radio station or adjust the heat or air conditioning. No personal hygiene care Drivers and slugs should avoid things like putting on make-up and combing hair. Letting a ride pass. Slugs have the right to pass or forfeit a ride if they don't like a particular car. If you've ever sat in rush-hour traffic, gazing longingly at the cars rushing by in the high-occupancy vehicle lanes, try doing something your parents warned you never to do: Hop in a car with a complete stranger behind the wheel. In a few cities, like Washington, D.C., formerly lone motorists can zip over into those HOV lanes thanks to a rare breed of commuter called a "slug." And with gas prices through the roof there's now an extra incentive to do it. By 7 a.m., at a non-descript parking lot in suburban Virginia, the line of blue and grey business suits stretches down the sidewalk. Men and women stand quietly, patiently waiting their turn. As SUVs and station wagons pull to the curb, the driver announces his destination to the person at the head of the line — the "caller" in slug parlance — who then relays that information to the slugs behind. The drivers need an extra body or two to get into the high-occupancy lanes. So they pick up the slugs, who get a free ride into the city and a faster commute themselves. The system isn't overseen by any government — it has evolved organically over the years. There are rules, like no smoking or eating by driver or slug. Slugs may not adjust windows or talk on cell phones. And there's no messing with the radio. These are some of the rules listed on Slug-Lines.com. Kevin Ellison has been slugging for five years now. He's clearly a friendly personality. But despite his disposition, Ellison has always carefully observed another unofficial tenet of slugging etiquette. "I have never told my name to anybody," he says. "Nobody's ever told me their name. It's not like at a cocktail party. It's, I'm doing him a favor, he's doing me a favor. We're each glad that the other one is doing the other one a favor, but we don't give names." Five days a week, year after year, these men and women sit thigh to thigh with their suburban neighbors in a space no bigger than a closet for up to 60 minutes at time. But no names. And Ellison says the chit-chat that does occur is highly regulated. "You avoid controversial subjects ... avoid religion and politics and talk about neighborhood affairs," Ellison says. In the sanctum of the station wagon, there are no sad stories of troubled children or financial ruin. There's no death, no divorce. And, says another slug, Steve McCale, on the rare occasions when people stray into difficult territory, they're policed. "It starts, and then people tend to stop it if it does get going," McCale says. Despite these rules, people in San Francisco, Pittsburgh and Washington stand in line by the hundreds. Ellison says the high-occupancy lanes shave close to half an hour off his commute. In the Washington suburbs, that's typical. But not everyone in line is there to save time. Juan Sanchez has been slugging for about a year, even though it turns his 55-minute daily commute into a 2 1/2-hour odyssey. He has to walk 25 minutes from the drop-off place in Washington, then catch a shuttle to his job as an accountant. But he does it anyway because commuting to D.C. costs about $15, including $10 for gas, he says. Sanchez, like most of the slugs in line, does not find the slugging rules oppressive. On the contrary, it's a system that allows total strangers to tolerate each other for long periods of time in a very small enclosed environment. Still, like every human endeavor, occasional departures from the norm are inevitable. And Ellison, the friendly man who hasn't shared his name in five years, says that his very best day slugging was extremely atypical. "A young woman with a sports car picked up the three of us. It was in the middle of the summer. As we were leaving the District, it was very slow and hot, and she turned around and she told us, 'OK, it's hot now, but don't worry. Once we hit the road, I'll be going fast and you'll cool off." Sure enough, once they hit the highway she floored it. Ellison remembers the exhilaration of speeding under the open sky. "The wind blowing on my face, I had to hold on to my eyeglasses to make sure they didn't blow off," he says. It was the first time, Ellison says, he had ever been in a speeding sports car. It was a radical departure from slug routine that he says he will never forget. Video: Ride along with slugs in Washington, D.C.